Team approaches. Photo By: Barry Bracken, Petersburg Marine Mammal Center. A team of four, trained volunteers from Petersburg has been trying to free a young grey whale that’s tangled in some sort fishing net and line. 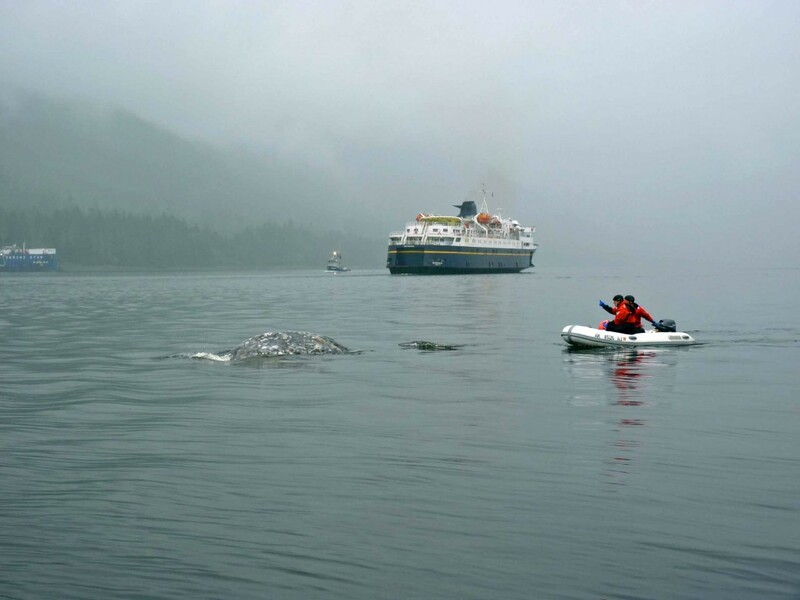 Grey Whales are unusual for the area. The animal was originally spotted in ideal cove, south of Petersburg but the responders found it this morning in the Wrangell Narrows right near town. The team is trained to respond to tangled whales as part of the Alaska Marine Mammal Stranding Network. Petersburg Marine Mammal Center President Barry Bracken is part of the effort. He says the animal appears injured and emaciated and from what they can see so far, the netting does not look like the type of gillnet gear used in southeast, which suggests the whale may have been tangled for a long time. The team is working from Bracken’s charter vessel “Island Dream”, he gave Matt Lichtenstein an update by cellphone late this (Friday) morning.